This weekend I'm taking a big step and driving my car (which belonged to my parents until this week) up to Newcastle. The longest distance I've driven before is up to Bristol from Plymouth (about 2 hours), so I'm going quite a bit further, but it has to be done some time so there's no time like the present. I'm especially excited because I'm going to Cadbury World today. I've never been before, and am very excited by the copious amounts of chocolate I'll be exposed to. I've been picturing an almost Willy Wonka-esque factory, but I know I need to tone down those imaginings just ever so slightly. I'm meeting up with my ex-housemate, who was also my biggest cake eater when we lived together. I've sent him a lot of cookies, and even managed to post a battenburg cake for his birthday, but I don't think cupcakes would translate very well in the post. This is a pity, because none of my housemates eat/like cake. I know - who are these people?! Anyway, since we're meeting up in person I've made some cupcakes to give him, since they are less likely to be squashed and unappealing by the time I reach him. I'm really pleased with these cupcakes. The icing (adapted from Sweetapolita) is soft and airy, and the strawberries in the centre help to cut through its sweetness. These are actually surprisingly simple to make: all you need to do is make the cupcakes, cut a hole in the middle and fill it with a strawberry, then cover it over with icing. The icing is as easy as melting chocolate and blending it into icing sugar and butter. I strongly encourage you to give them a go, as they managed to entice even the least sugar-loving members of my family. Cupcakes for everyone! To make the cupcakes: cream the butter and sugar together until light and fluffy, then beat in the eggs, one at a time, until smooth. Stir in the vanilla essence, then add enough milk to give the batter a soft dropping consistency. Divide the batter between the cupcake cases, then bake in the oven for 22 minutes, or until a skewer comes out clean. Leave the cupcakes to cool on a wire rack, then scoop out the middle (don't go all the way to the bottom) of each cake using a knife and place a hulled (destalked) strawberry inside. To make the icing: melt the chocolate in a pan over a low heat. Use an electric whisk to combine the butter and icing sugar, then continue whisking for another 2 minutes. Add the white chocolate, then whisk the icing for 2 more minutes. Use a piping bag to decorate the cakes with the icing. 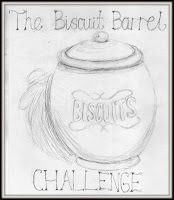 I'm entering these into Laura at I'd Much Rather Bake Than...'s blogging challenge, The Biscuit Barrel Challenge. No, these aren't biscuits, but she says anything that will fit into a biscuit barrel goes. I'm not saying these wouldn't make a big mess inside the barrel, but they would totally fit. Laura's theme is In Season Fruits, so strawberries fit in perfectly here. They look fabulous Janine and what a lovely surprise to find a strawberry when biting into the cake. I always think I might mess up cakes if I start digging holes in them, so haven't dared try anything like this - yet! Hope you had fun on your chocolate tour. Good! I love strawberries! These cupcakes are delicious! These would be very dangerous to leave unguarded around me because I'm such a strawberry fiend Also, I think I may have given your housemate a run for his money as chief cake eater if I had been living with you! Haha thanks, I take that as a great compliment coming from a fellow baker!